It is Digital Signage Desktop Software / Content Management Software. It can play back various types of media with your monitor, everything can be uploaded to the monitor. Multi-Zone - Normally, one display unit has only one single screen to display video or TV program or image at any single point of time. AV Manager allows us to split one single screen into two or more zones ( partitions). Each zone can has its own schedule of events, and display different types of contents simultaneously. Display Content in Multiple Formats - Various types of contents are supported, such as MP4, MOV, MPEG 1, MPEG 2, M2TS, F4V, MKV, .DIVX video, picture, website, text, flicker free scrolling text, RSS Feeder, RSS Scrolling text, digital clock, Power Point (PPT, PPTX , need installed MS PowerPoint Viewer 2010), Flash File, TV channel or cable TV programs, live broadcast event from Microsoft Expression Encoder . User friendly Design - It designed to be easy enough for anyone to use without training. Sequence management - Sequence feature is to group a number of contents into groups or categories each with a sequence of play-list order, so that users can easily schedule multiple events. Schedule Wizard - Step by Step to create the schedule, without having to learn any special programming syntax. Each zone can be custom-sized by you, and you can then schedule different content in each zone. Central location management - control over your network of digital signage displays from one central location. Layout Template - You may select existing 38 layout templates or create new layout. You may select add frame to layout when you selected background image. Preview - \"What you see is what you get\" in the Content and Schedule Entry Preview pane. You can make unlimited changes to your templates to get them looking and performing exactly as you like before deploying these changes to your environment. Emergency Messaging - Whether you have an existing emergency notification infrastructure or not, you can your signs to display emergency alerts. Upload Schedules - Upload schedules and contents to different display unit over an internet or LAN. You may upload the schedule immediatley or upload the schedule at specified time. Network Tree - The Network Overview lets you lay out your signage environment in a way that makes sense to you. An unlimited number of locations and signs can be created and arranged according to the logical layout of your company. added new MP4, MOV decoder, it support playback HD MP4, MOV video files. added new Powerpoint Viewer engine, it support view the PPT, PPTX file using Microsoft Powerpoint viewer, not need installed MS Powerpoint on Windows XP, Vista, Windows 7, Windows 8, Windows 10. For Windows 8 and Windows 10, the Powerpoint content will have limitation, the content will not resize. added according your screen resolution, it will auto updated screen resolution of Layout templates files, You can using default Layout templates without need manual update again. added support on Windows 10.
fixed cannot playback mov and mp4 video issue. fixed some bugs on windows 7 and windows 8.
add more instruction when connected to av scheduler failed. added allow display Power Point (PPTX) File without installed MS Power Point or Power Point viewer. added allow create Power Point (PPTX) File without installed MS Power Point or Power Point viewer. improved setup demo database location. First time running the AV Manager, all path of demo data will updating automatically. updated Installation Guide in help file. added allow manually enter the pixel size and location of each zone in layout form. fixed the pixel size of zone will changed when updated the layout. fixed power point content icon issue in sequence. 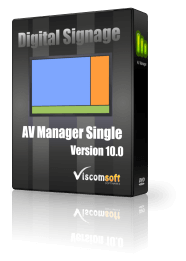 added digital signed for exectuable of AV Manager and AV Scheduler and exectuable of installer files. added allow add a frame to layout. added live broadcast content, it can received the live events from Microsoft Expression Encoder. You may streaming TV station from tuner cards, Streaming live video from web cam, capture card, Streaming video from video file and Streaming screen capture. fixed cannot playback some youtube FLV video. added support playback MKV and .DIVX video when purchased HD decoder plugin. added flash analog clock sample content. added 5 frame sample image. fixed crash issue on some window xp SP3 computers. updated timer upload schedule, now it can press delete key to delete the item. updated help files, step by step Installation Guide. added contents shortcut, let the user create the content more easily. fixed some m2ts videos cannot playback issue. fixed some f4v videos cannot playback issue. added RSS Scrolling text feature, allow feed the text from RSS source and display scrolling text. Support Vertical or Horizontal Scrolling text. added support PNG file image format for image, text, rss text, digital clock contents. fixed video content transparent issue when using on window 7.
added support delete sequence\'s content automatically when delete content. Redesigned playback flash file engine. Fixed some swf cannot playback issue. added allow select background color, aspect ratio when playback flash(SWF) file. added allow add HD decoder plugin for playback M2TS, F4V video. changed allow input longer URL link in web page content. fixed hang issue when stop the wmv file in video content. fixed crash issue on some computer when run timer upload to upload schedule. 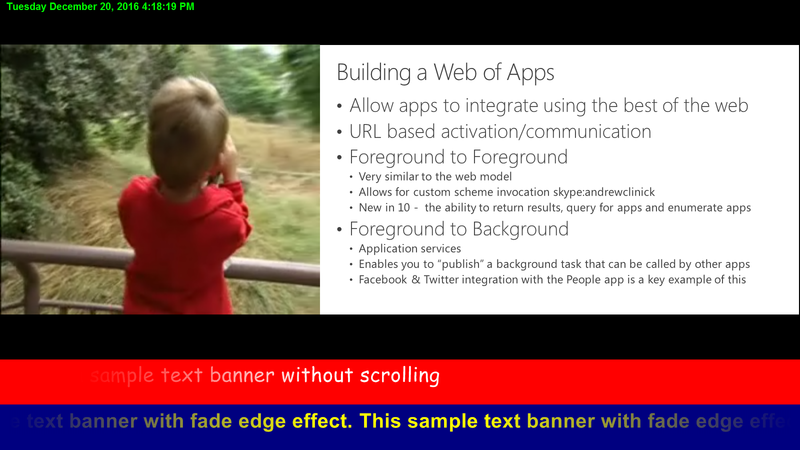 Redesigned scrolling text engine, flicker free scrolling text, vertical scroll up, down effect and fade edge effect. fixed some video input pin cannot read with some capture card. fixed Delete timer upload sometime crash issue. improved adhoc message cannot send to av schedulers issue. Added log feature in av scheduler, it can count for how many content displayed for each schedule. Fixed some powerpoint content bugs. Fixed Invalid IP issue when upload the schedule on specific network. Added Built-in MPEG2, VOB Decoder.It support playback mpeg2, vob video file. Added Built-in FLV Decoder. It support playback flv video file. Released Japanese, Korean, Chinese Simplified version (support input and display specific language of text in text content). Removed border when running on vista. Added Hebrew language in text content. improved support hauppauge win tv capture card and tv capture quality. added support playback mov file. added allow ftp over internet. added allow select different language when send adhoc message.